Review by AllTheBestFights.com: 2017-11-11, some good exchanges in the second part of the fight but it is not enough to get three stars: Cezar Ferreira vs Nate Marquardt gets two. The black belt in Brazilian jiu-jitsu and Tuf Brazil tournament winner Cezar Ferreira entered this fight with a professional mma record of 11-6-0 (55% finishing rate) and he is ranked as the No.36 middleweight in the world but ‘Mutante’ comes off the loss against Elias Theodorou (=Ferreira vs Theodorou). His opponent, the black belt in Brazilian jiu-jitsu and former Strikeforce Ww champion Nate Marquardt, has an official record of 35-18-2 (77% finishing rate) and he entered as the No.39 in the same weight class but he lost three out of his last four bouts, the last two with Sam Alvey and Vitor Belfort (=Belfort vs Marquardt). 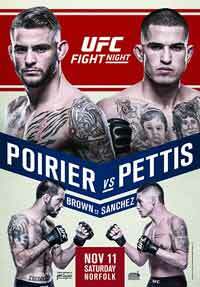 Ferreira vs Marquardt is on the undercard of Dustin Poirier vs Anthony Pettis – UFC Fight Night 120. Watch the video and rate this fight!